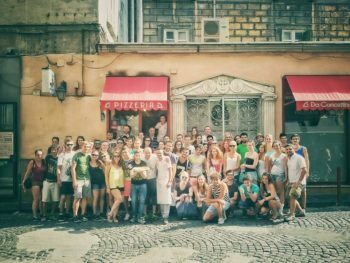 AEGEE Summer Universities are the best way to get to know Europe – and definitely one of the cheapest one. It is amazing what the organisers manage to provide with a small budget. However, in the past five years the fees went up by more than 20%. While 14 SUs for 100 Euros or less were offered in 2002, this year the cheapest one is 109 Euros. And while five years ago 40 SUs cost 150 Euros or less, this year the number is five. 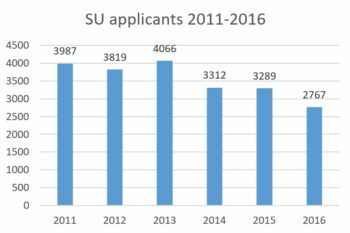 Parts of the network are concerned that the number of SU applicants might become even lower than last year due to this development. 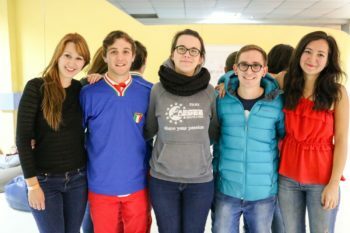 As a solution, AEGEE-Europe President Réka Salamon suggests to increase European fund-raising efforts – and proposes a brainstorming day about the future development of the Summer Universities at the autumn Agora in Catania. Already for several years the shrinking number of applicants and courses in AEGEE’s longest running project have been of concern. The number of applicants went down from more than 4000 in 2013 to less than 2800 in 2016. Also the number of 65 SUs this year is the lowest since 1992, when the project was just four years old. There are many explanation attempts for the decrease: the shrinking number of antennae and decreasing amount of members, trends in society such as more individualistic travels thanks to low-cost carriers, the tendency of locals to share the workload by organising Traveling Summer Universities. And of course the economic crisis in large parts of Europe and the war in Ukraine are also reasons that are often mentioned. 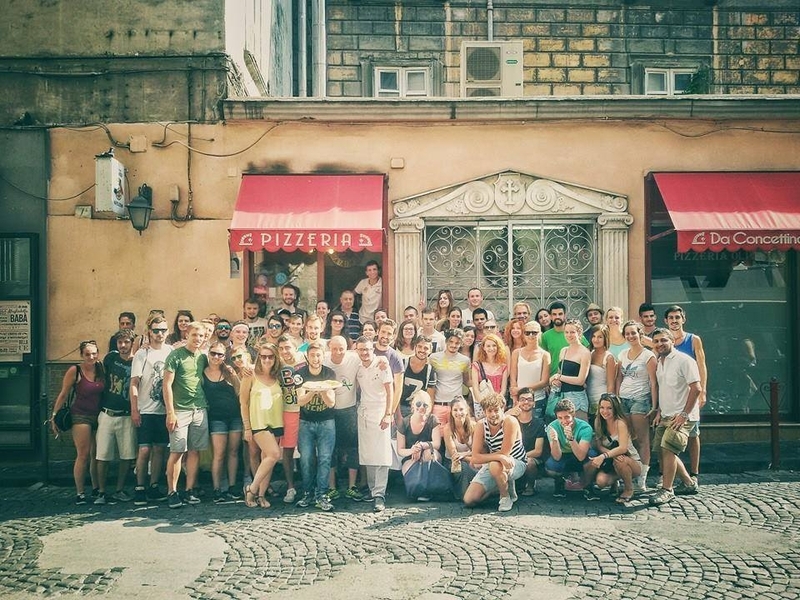 Cheap SUs are possible: In 2015 AEGEE-Napoli organised the SU “Past & Fasul – Through the ages of time!” with 12 days for 95 Euros! Two years ago there were 16 SUs for 150 Euros or less – this year there will be only five. In recent years the fees were raised in order to make it easier for antennae to organise high profile Summer Universities. This is visible in numbers. Five years ago the average fee was considerably lower: it was 154,60 Euros in 2012 and it is 186,68 Euros now, while the average duration of an SU is unchanged. The main difference is that there were a lot more affordable SUs, courses below the psychological threshold of 100 Euros. In fact in 2012 seven SUs cost less than 100 Euros and another seven exactly that amount. Plus, there were another 26 SU for less than 150 Euros. In total, every second SU was cheaper than 150 Euros. 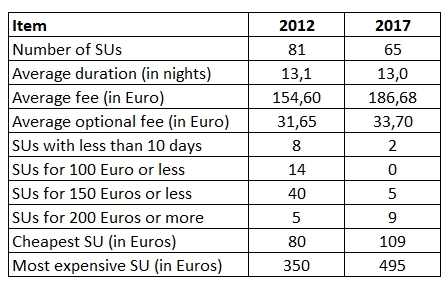 This year the cheapest SU costs 109 Euros and there is a total of only five SUs for 150 Euros or less. The lower prices in 2012 were also possible because shorter courses were in fashion. Eight SUs lasted ten days or less, compared with two courses today. Jorge Sanchéz Hernandez advocates for more SU fund-raising. Here you see Jorge with one of his fund-raising successes for his SU of 2015. The average SU fee increase of 20.6% is more than overcompensating the inflation in the EU, where more than two third of SUs are taking place: in the European Union the average annual inflation in the past five years has been 1.1%. 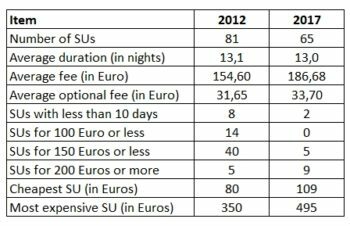 Of course, one cannot blame SU organisers for the price increase, since most of them simply make use of the allowed possibility to charge 14 Euros per day. Nevertheless, the question is whether the SUs actually provide better services than five years ago or whether fund-raising is neglected since the fees cover all costs. The number of applications especially of Poland and Ukraine fell. In some other countries the inflation has been a lot higher than in the EU, but so has been also the currency devaluation in relation to the Euro. For example in Turkey inflation was 8.3% in the average per year since 2012 and in Ukraine even 15.2%; nevertheless, the exchange rate also changed: five years ago you had to pay 2.44 Turkish Lira for one 1 Euro, now it is 3.99 – that’s a dramatic loss in vale. It was even worse for the Ukrainian Hryvna, it fell from 10 to 28 Hryvna per Euro. In general, it is not easy to draw conclusions without considering how the network developed in certain areas in recent years. For example, in Russia AEGEE developed quite well. So, despite the fact that the Russian Ruble lost around 50% of its value since 2012 – from 40 to 63 Ruble per Euro – the number of SU applications by Russian members went up, from 122 to 165. 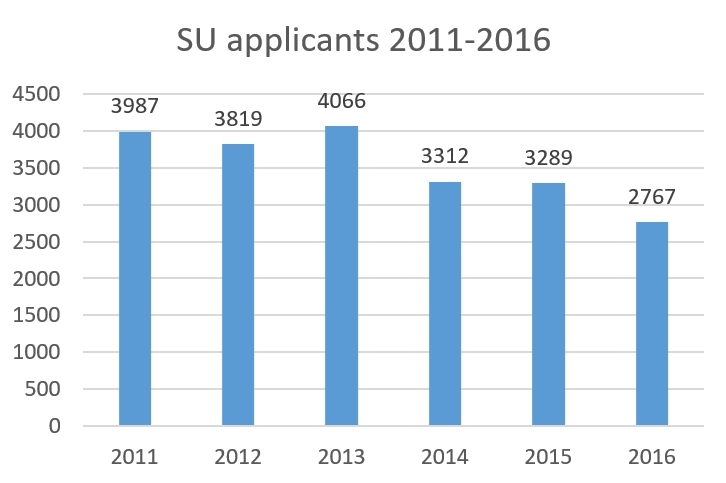 The biggest decrease of SU applications happened in Spain, a country which suffers from a huge youth unemployment. From here traditionally most SU applications originate and this is still the case today. However, while in 2013 altogether 995 members of Spanish antennae applied, the number dropped to 669 last year. No wonder that the issue of rising fees has been discussed intensively among Spanish members last week. 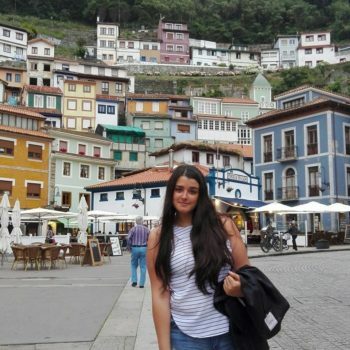 “Paying 200 Euros fee for an SU plus flights, food, drinks… in the end it is a big amount of money”, says Cristina de la Parte, Vice-President of AEGEE-León and ACT member (see a full interview with Cristina below). Next to the high average fee of 186.68 Euros there is also an optional fee of 33.70 Euros per SU. The high average fee is also the result of an increasing number of exceptions that were granted. 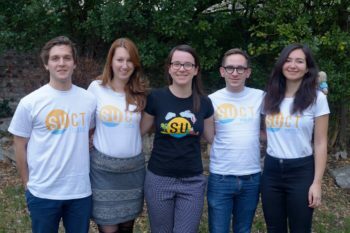 “We are constantly looking for solutions to keep the price as low as possible”, states the Summer University Coordination Team. “This year we have received many requests for a higher fee. Every single one of them has to have an approved budget – we checked all of them very carefully. We rejected many of the requests or lowered fees. We also skyped with a few organisers who would not be able to organise an SU if we don’t accept their request.” The SUCT also stresses that without the exceptions many events would not take place (see the full SUCT statement below). 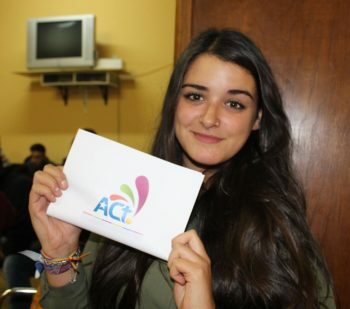 The point of view of Cristina de la Parte, Vice-President of AEGEE-León, member of ACT. 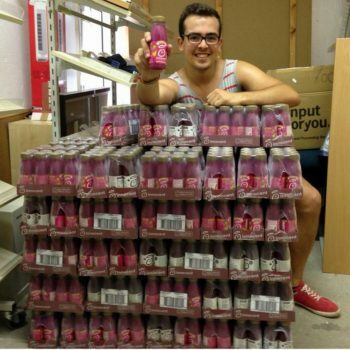 Golden Times: Cristina, is the rise of SU fees a problem for some of your members? Or is it irrelevant, because travelling is expensive anyway and the SU fees don’t matter in the mix? 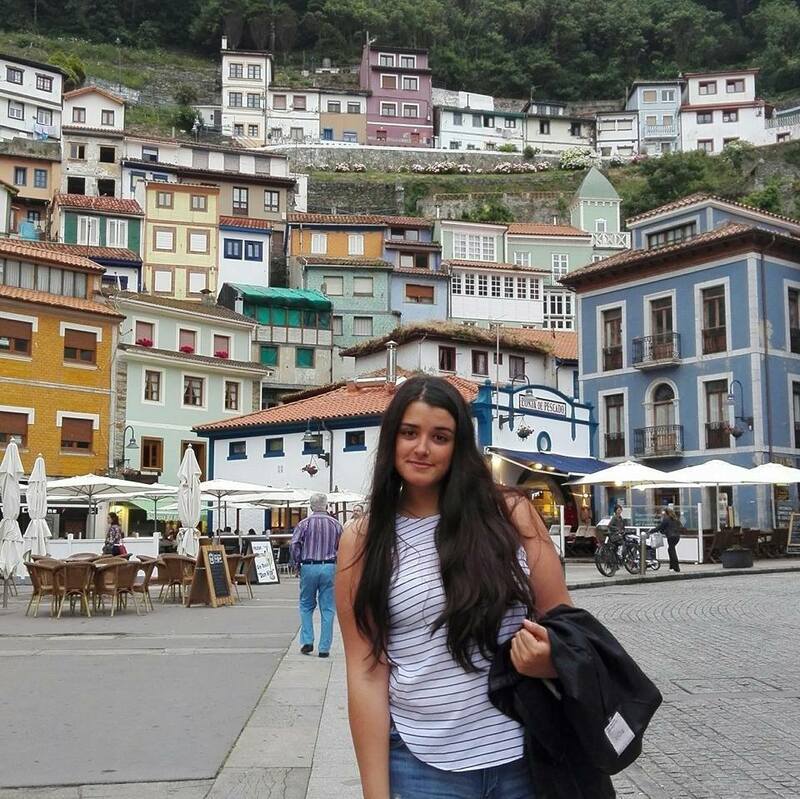 Cristina de la Parte: I think it is a problem, because many people cannot spend so much money on travelling, and travelling is not even always expensive. Paying 200 Euros fee for an SU plus flights, food, drinks… in the end it is a big amount of money. Cristina: That clearly proves that SUs got more expensive in the last years. More than 30 Euros in five years is too much! GT: Do you actually know people who do not apply for an SU because of higher fees? Cristina: I know people that have applied for a specific SU because the fee was super low, and they could only afford that particular SU. GT: So what is the solution? What can AEGEE do? Cristina: It is complicated to find a solution because with low fees it is harder – but not impossible – to provide everything to the participants, such as lodging, food, transportation and activities. We should give people the opportunity to help and participate in an SU by paying a lower fee. GT: How can you give that opportunity? Cristina: It is up to the organizers of the event to accept helpers that want to help and participate in the SU. It could be a solution for those members who cannot afford the fee and other expenses, if SU organizers let them participate by paying less money and receiving their help in return. 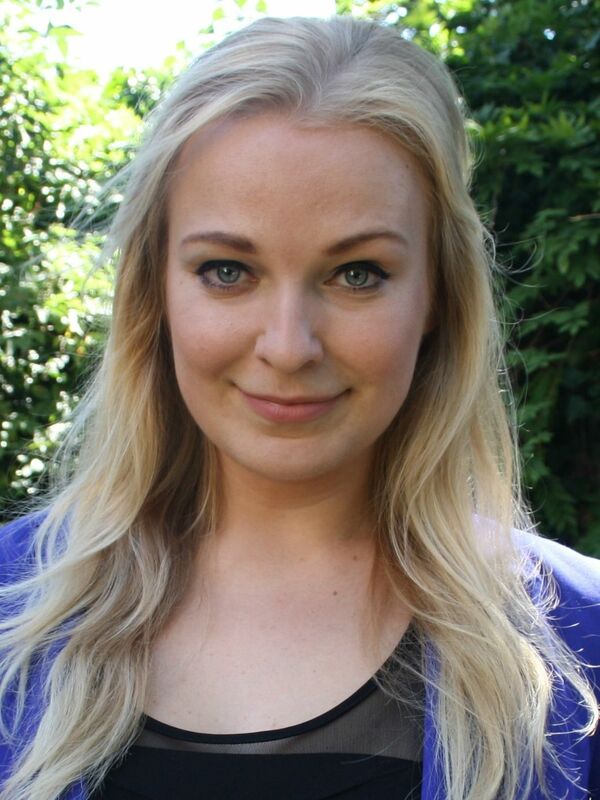 According to AEGEE-Europe’s President the association should find new means to provide financial support. Réka Salamon, President of AEGEE-Europe: “I fully trust the work of the SUCT in trying to support the local organisers in creating the most reasonable budgets for their SUs, as well as I am sure the locals simply need to push for higher fee, if they want to provide quality programme and entertainment for the participants. What we need to realise is that society around AEGEE is changing. You can feel life becoming more expensive, the financial crisis and heavy inflation badly affecting some countries and areas of the network, we have high youth unemployment rates, there is simply a crisis in Europe. We need to upgrade AEGEE’s fundraising activities and adapt them to an increasingly competitive and challenging society. I believe it should be the role of AEGEE-Europe to find practices and means to provide financial support for AEGEE activities, including Summer Universities. How? We can explore UNESCO resources for cultural exchanges, we can learn more about Erasmus+ youth exchanges for getting funded thematic elements in the SU. We can focus on human rights and democracy as SU topic and turn to the Council of Europe. We can also build stronger bridges with institutes for cultural heritage education, for intercultural learning, there are so many possibilities. Think about five language Summer Universities that are being organised in partnership with an actual language summer school, and as a project funded by EU funds. How to define which local is interested in which topic? How about we allocate one day of the autumn Agora only for SU development practices, from beginners to experienced members. 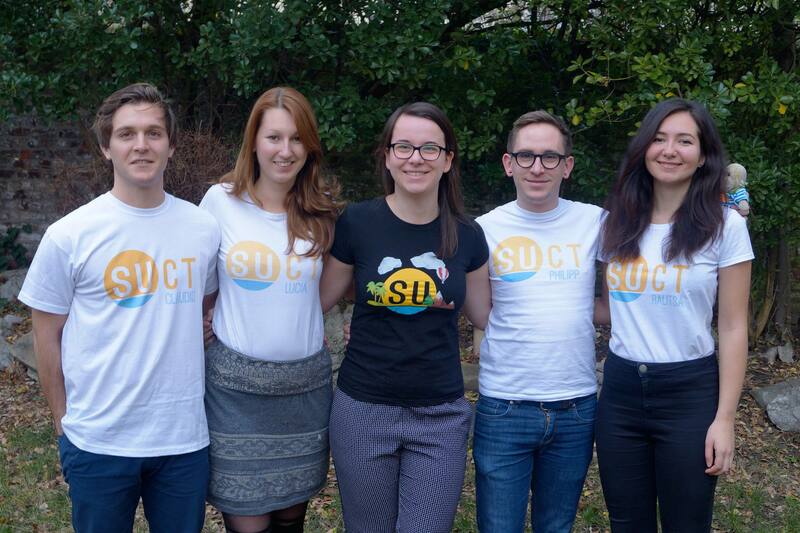 We can define cooperations and topic ideas early, so SUCT and AEGEE-Europe can look into funding options by the end of the year or beginning of next year. The Summer University Coordination Team wrote an open letter. we just want to let you know that we are really happy so many people engage with this project! We are happy you are helping us with the quality assurance, so we decided to provide you some background information. This year we have received many requests for a higher fee. Every single one of them has to have an approved budget – we checked all of them very carefully. We rejected many of the requests or lowered (optional) fees. We also skyped with a few organisers who would not be able to organise an SU if we don’t accept their request. We are constantly looking for solutions to keep the price as low as possible. We need to realize that we have a big amount of SUs which require long distance travels – the cost of the Transsiberian can’t be lowered technically, also flying from Greece to Spain for an amazingly low fare will still boost your budget. Imagine travelling with a train through whole Italy or have the transport between Turkey and Greece included. Please realize that most internal criticism in AEGEE is about shrinking numbers. Without the exceptions we would lose many great events, and demotivate the organizers that already put work in the planning and try to make the best event with only 14 Euros a night. How many of you joined AEGEE because of Summer Universities? Last but not least, we would like to stress that we are always happy to receive direct feedback, which can come in any of the following forms.